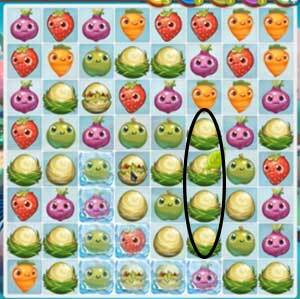 These Farm Heroes level 229 cheats and tips will help you beat level 229 of Farm Heroes. 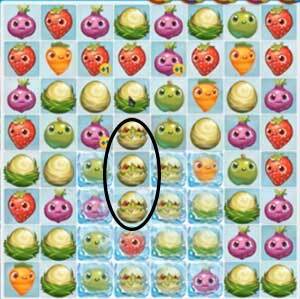 The objective of Farm Heroes level 229 is to collect 3 dragons, 45 strawberries, and 45 onions in 28 moves. Each raptor takes three forms to hatch, and three total have to be collected to finish the level. This means you have to make at least 9 raptors egg combinations to meet the level requirement. Prioritize this ingredient over everything else. 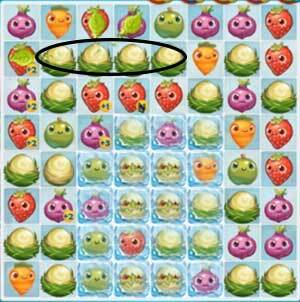 A large chunk of the middle of the board is inaccessible to the player because it is frozen. Line up prospective cropsies to break through the center of the map and really open up the board! This is especially important for collecting raptor eggs. Because the raptor eggs take so much time to collect, the other required cropsies may fall by the wayside. Make up for lost time by combining 4-6 cropsies in a row to scatter +1 point bonuses across the board! Youll be caught up to the level objectives in no time.